1) (Rev. John Dean, D.D., Principal of St. Mary’s Hall, Oxford, and rector of Oulde, co. Northampton). Sa. a fesse dancettee ar. in chief three crescents or. Crest—A demi lion ramp. or, holding betw. the paws a crescent sa. 2) (London). Ar. on a chev. sa. betw. three Cornish choughs ppr. as many crosses crosslet or. Crest—A griffin’s head erased ar. 3) (co. Northampton). Ar. a fesse dancettee, in chief three crescents of the second. 4) Ar. a lion ramp. purp. Crest—A pillar winged ppr. 5) Ar. a fesse dancette betw. three crescents gu. 6) (Galway, Reg. Ireland). Az. three wings or. Crest—A demi lion az. 7) (Galway). Same Arms, with a chief ar. charged with a griffin holding a harp gu. Crest—A wing or. 8) (Baron Musketry). Ar. two bars gu. Crest—On a ducal coronet or, a crocodile statant ppr. Supporters—Two angels habited and winged az. with palm branches in their exterior hands vert. Motto—Forti et fideli nihil difficile. 9) (Mattingley, co. Hants; previously of Wallingford, co. Berks; confirmed by Camden, 1623). Vert on a chev. betw. three griffins’ heads erased or, beaked gu. five mullets sa. Crest—A griffin’s head erased or, betw. two wings erect vert. 10) (John Bathurst Deane, Esq., of Bath, a descendant of the Deanes of Mattingley). Same arms, with the mullets vert, and a crescent for diff. Motto—Fortiter et fideliter. 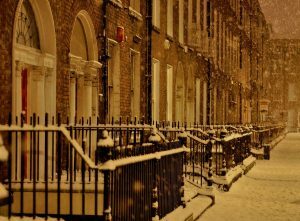 11) (co. York). Gu. two chev. within a bordure ar. 12) (co. Berks). Sa. two bars ar. within a bordure gu. 13) or Dedan or Dene (Newton Patrock, cos. Devon and Leicester). Ar. a lion ramp. purp. Crest—A lion’s head erased ar. 14) (Maplestede, co. Essex, and Blackburne, co. Lincoln). Sa. a fesse erm. betw. three chaplets ar. Crest—A bear’s head couped ar. muzzled or. 15) (Gosfield, co. Essex; confirmed 8 May, 1577). Same Arms, a crescent for diff. 16) (co. Essex). Ar. a fesse dancettee gu. 17) (co. Essex). Ar. on a fesse gu. betw. three crows ppr. as many crosses pattee or. 18) (Yatton, co. Hereford). Ar. two bars and a canton gu. 19) (co. Huntingdon). Ar. two bars sa. 20) (co. Leicester). Ar: a lion pass. purp. 21) or Deene (co. Lincoln). Gu. two (another, three) chev. within a bordure ar. 22) (Lord Mayor of London, 1628; represented by W. C. Deane, Esq., of Webbury, co. Devon). Ar. on a chev. gu. betw. three birds sa. as many crosses couped or. 23) (Deanelands; granted by Dethick, Garter. To this family belongs Dr. Deane, Q.C.). (Eastwole House, co. Herts). Gu. a lion couchant guard, or, on a chief ar. three crescents of the field. Crest—A demi lion ramp. or, holding betw. his paws a crescent gu. 24) (London; founded by Richard de Dene, temp. Edward III.). Gu. a lion ramp. guard. or, on a chief ar. three crescents of the field. Crest—A demi lion ramp. or, holding in the dexter paw a crescent gu. 25) (Sir James Deane, Knt., of London. Her. Visit.). Gu. a lion sejant guard, or, on a chief ar. three crescents of the first. Crest—A demi lion ramp. or, holding in the dexter paw a crescent gu. 26) (London. Fun. Ent. of Dorothy, dau. of John Deane, of that city, d. 14 June, 1616. She was three times married, 1st, to Henry Perkin; 2nd, to Robert Constable; 3rd, to Sir Charles Calthroppe, Attorney-General for Ireland). Barry of six ar. and az. a canton gu. 27) (Syeston, co. York). Gu. two bars within a bordure ar. 28) (Tilney Marsh, co. Norfolk). Gu. two chev. ar. each charged with three crosses formee sa. within a bordure of the second. 29) (co. Rutland). Ar. a fesse dancettee betw. three crescents gu. 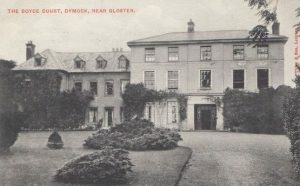 30) (co. Derby, Matlock, afterwards Buly, descended from the Deanes of Deane Hall, co. Chester. Visit. Chester, 1641, where five descents are given). Or, a fesse dancettee gu. in chief three crescents of the last. 31) Az. a sword in bend ar. hilt and pomel or, in bend sinister a tilting spear (surmounting the sword) of the last, headed of the second, between three fleurs-de-lis gold, one in chief and two in fesse, and as many gem rings in base of the last, gems gu. one and two. Crest—A hand couped ppr. lying fesseways, holding a fleur-de-lis or. 32) (co. Sussex). Per bend sinister enhanced az. and gu. in the dexter chief a maunch or, with hand ar. 33) Gu. three bars ar. on a canton of the second a bull pass. of the first. 34) Ar. two bars sa. each charged with three crosses formee of the field (another, or). 35) Ar. a chev. erm. betw. three butterflies volant gu. 36) Gu. a saltire erm. 37) Vert on a chev. betw. three eagles’ heads erased or, five mullets sa. 38) Az. on a bend or, an annulet gu. 39) Ar. two flasques sa. on each a leopard’s head of the field. 40) or Deanke – Gu. two bars ar. in chief three annulets of the second. 41) (Cromlin and Terrenure, co. Dublin, afterwards of Castle-Cor, co. Cork, and Berkeley, co. Wexford. Fun. Ent. of Elizabeth. dau. of Joseph Deane, Esq., of Cromlin, and widow of Henry Grey, Esq., of Audley Grey, co. Dorset; buried in St. Bride’s Church, Dublin, 18 February, 1684). Ar. on a chev. gu. betw. three Cornish choughs sa. beaked and legged of the second, as many crosses pattee or. 42) (Berkeley, co. Wexford. John St. George Deane, Esq., of Berkeley, descended from Deane, of Terrenure and Cromlin, co. Dublin). Ar. on a chev. gu. betw. three Cornish choughs sa. beaked and legged gu. as many crosses pattee of the field. Crest—A tortoise displ. ppr. Motto—Ferendo not feriendo. 43) (granted to John Deane, Esq., Mountjoy Square, Dublin, 1808). Or, on a chev. az. betw. three doves’ wings erect ppr. each charged with a fleur-de-lis vert, as many trefoils slipped of the first. Crest—A demi griffin segreant az. ducally crowned or, holding betw. the paws a harp ppr. and charged on the shoulder with a trefoil slipped gold. Motto—La foi me guide. 44) Gu. a chev. ar. betw. ten bezants. 45) Or, a fesse sa. This popular surname had four origin theories. First, it is an English topographic/habitational last name, deriving from the Middle English word dene, meaning “valley”, referring to people who lived in or were from various places in England called Dean, Deen, or Deane and from places n Scotland called Den (in Aberdeenshire) and Dean (in Ayrshire). Many times, it serves as the suffix in local place names such as Rottingdean and Todmorden. Some assert it derives from the Anglo-Saxon word denu, meaning a plain or vale. Second, it could be an occupational name, referring to a servant to a Dean, or looked like a Dean, which was an ecclesiastical official who was the head of a chapter of canons in a cathedral during medieval times and the Middle Ages, deriving from the Middle English word deen, itself from the Old French deien, itself from the Latin word decanus, a leader of ten men. Some spelling variants or names with similar etymologies include Deane, Dene, Denne, Deen, and Deain. The last name Dean ranks 250th in popularity in the United Status as of the 2000 Census. The name ranks particularly high in the following seven states: Georgia, West Virginia, Ohio, Virginia, Michigan, Alabama, and Oklahoma. The surname Dean frequency/commonness ranks as follows in the British Isles: England (169th), Scotland (587th), Wales (328), Ireland () and Northern Ireland (618th). In England, it ranks highest in counties in Cheshire and Buckinghamshire. In Scotland, the surname ranks highest in Moray. In Wales, it ranks highest in county Denbighshire. In Ireland, it ranks highest in county Leitrim. In Northern Ireland, it ranks highest in county Antrim. The name is also present throughout the remainder English speaking world: Canada (531st), New Zealand (295th), Australia (197th), and South Africa (1,300th). Henry Brougham Guppy’s 1890 book Homes of Family Names in Great Britain states the following in regard to this last name: “This name has two principal areas of distribution, one in Cheshire, Staffordshire, and in their vicinity, the other in the south of England, especially in Wilts and in the counties adjacent. There are numerous parishes of the name in the south of England, a circumstance that explains the prevalence of the name in that region”. The first documented person of this name was Ralph de Dene, who was recorded in the Domesday Book in 1086 AD. Some of the earliest documented bearers of this include William and Godrey Decanus of Normanndy who lived around 1190 AD, as well as Batholomew, Ralph, and William Decanus of England in 1189, and Thomas and Hugh Decanus who were recorded in the Rotuli Curiae Regis). The Hundred Rolls of 1273 AD, a census of Wales and England, known in Latin as Rotuli Hundredorum lists three bearers of this surname: Thomas dela Dene (Hertfordshire), Jacob de la Dene (Kent), and Robert le Deen (Cambridgeshire). The Poll Tax of 1379 AD lists three bearers documented in Yorkshire, England: Johanna del Dene, Willelmus del Dene, and Johannes de Denne. A one John le Dean was documented in Somerset in 1327 AD. A one Robert de Den, canon of Dunkeld, was documented in 1345 AD. A one Johannes de Den, who lived in the parish of Fyvy was excommunicated in 1382 AD. John Dene was a burgess of Irvine in 1499. William Dane, a burgess of Arne, was documented in 1503. Thomas Deyne held a tenement in Irvine in 1542. John Deyne was a monk of Kilwinning Abbey in 1557 AD. Two early marriages involving this surname include Mildred Dean to William Hawkes in 1585 at Newgate Street, London and Ruth Deane to John White in 1586 at Finchley. The ancestry of the great Deane family is ancient and traces back to Ireland, where they long held large estates and lands in said kingdom. It had previously lived in England, where this family owned lands in counties Northampton and Gloucester. We begin the discussion of the lineage or pedigree with Edward Deane of Cromwell who was a Member of Parlialment for Inistioge in 1661, High Sheriff of Dublin in 1677, and was Seneschal of St. Sepulchre in 1688. He had a son named Joseph who was born in 1623. Joseph Deane, an Esquire of Cromlin, who joined Oliver Cromwell, and was appointed Major of Cavalry in the Parliamentary army. For this, he received land grants in counties Dublin and Kilkenny in Ireland. In 1652, he married Elizabeth, daughter of Maurice Cuffe of Quin, and had three children with her as follows: Joseph, Elizabeth (married Captain Henry Gray and later Sir Donough O’Brien of Dromoland), and Dorothy (married Maurice Berkeley, Esq. of Skark). His son Joseph was his heir and he was an Esquire of Cromlin born in 1649. He married Elizabeth, daughter of Reverend John Parker, the Archbishop of Ireland, and had two sons with her: Edward (his heir) and Joseph (Lord Chief Baron of the Exchequer in Ireland, married Margaret Boyle of Castle Martyr, had issue named Elizabeth, Barbara, Mary, Katherine, and Margaret). He died in 1698 and was succeeded by his eldest son, Edward. 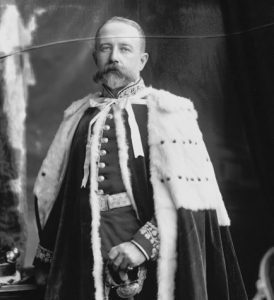 This son, Colonel Edward Deane of Cromlin, was a Member of Parliament, and inherited the estates of Terenure in Dublin and Dangan in Kilkenny. He married Elizabeth, daughter of Amias Bushe of Kilfane, and had the following issue: Edward (Member of Parliament, killed in a duel with Colonel Pigott in 1750), Amias, Joseph (heir), Frances (married Standish Grady of the Lodge), Wilhelmina (married Nicholas Bowen of Bowen’s Court), and Elizabeth (married Standish O’Grady of Kilballyowen). He died and was succeeded by his son Joseph. This son, Colonel Joseph Deane of Cromlin and Terenure, was a Member of Parliament for Inistioge in 1762, for Dublin in 1769, and for the county of Kilkenny in 1778. He married Jane, daughter of William Freeman of Castle Cor in Cork, and had by her a son named Edward, who later assumed the name Freeman. He later married Katherine, daughter of Colonel Greene of Greenville and had nine children with her as follows: 1) John Berkeley (discussed more below), 2) Joseph (of Stokestown), 3) William, 4) Amias Ferdinand (Captain of the 96th Regiment, married Mary White of Ballybrophy), 5) Frances (married Major Anthony Cliffe of New Ross and later Francis Corbet Singleton of Aclare and Corbet Hill), 6) Katherine, 7) Eliza (married Reverend Allan Cliffe of Hereford), 8) Wilhelmina (married John Edwards, Esq. of Camolin Park), and 9) Lydia (married Abraham Brush). He passed away in 1801 and was succeeded by his son John. 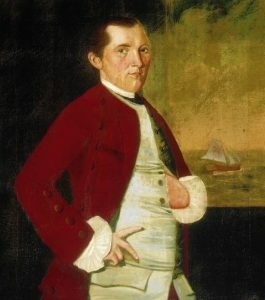 This son, John Berkeley Deane, was an Esquire of Berkeley, county Wexford, who, in 1800, married Cecilia, daughter of General Knudson, having the following issue: John St. George, George Knudsen (Barrister-at-Law, married Isabella Wise, and had issue named Berkeley St. George of the Royal Navy, Lieutenant George Knudsen, Freeman William, Henrietta Frances, Cecicilia Catherine), William (Lieutenant in the Royal Navy, married Caroline Nixon of Brownsbarn) Cecilia (married Reverend Lambert W. Hepenstal of Altadore), Frances, and Elizabeth (married James Lawrence Wise). John St. George Deane was an Esquire of Berkeley Forest, county Wexford, as well as a Justice of the Peace and Deputy Lieutenant who married, in 1847, Grace Wandesford, daughter of Thomas Kavanagh of Borris House, and later married Catherine, daughter of John Gordon of Aiken House. With the later, he had a daughter named Catherine Cecilia. The Deane family crest of this branch is blazoned in the medieval art of heraldry as follows: Argent, on a chevron gules between three Cornish Choughs sable beaked and legged on the second as many crosses pate of the field. Crest: A tortoise displayed proper. Motto: Ferendo non feriendo. The family was seated at Berkley Forest, New Ross. George Onslow Deane was an Esquire of Boyce Court, county Gloucester, England, born in 1828. In 1852, he married Georgiana Matilda, daughter of General John Drummond, and had issue, including a son named Horace Drummond who was born in 1854. He was educated at Winchester and Christchurch, Oxford and was a Magistrate for Gloucester. He also served in India was the 2nd Foot Regiment. He was the son of Reverend George Deane, Rector of Bighton and Mary Grant. The Deane Coat of Arms is blazoned as follows: Vert, on a chevron between three griffins’ heads erased or, beaked gules five mullets sable. Crest: A griffin’s head erased or, beaked gules, with a collar vert, between two wings erect or. Hon. Johnathan Fitzmaurice Deane (born 1986). William Denne was born in 1310 AD. He married Elizabeth de Gatton and had a son with her named Richard. Richard Denne was born in around 1349 AD. He married Agnes Apuldrefield and they had a son named Thomas. Thomas Denne was born in 1360 AD. He married Isabel De Earde and had a son with her named John. John Denne was born in Denne, Kingstone, county Kent, England in 1407. He married Alice Arderne and had a son with her named Michael. Michael Denne was born in Denne, Kingstone, Ken in 1440 AD. He married Christiana Fort and had a son with her named John. This son, John Deane was born in Chard, Somersetshire, England in 1500. He married Johanna Selwoode and had a son with her named Walter. Walter Deane was born in South Chard, Somersetshire in around 1545. He married Joan Walsele and had two issue with her: William and Joane. 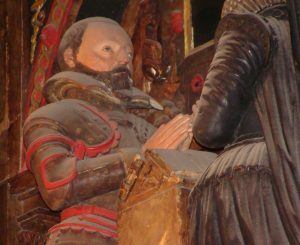 His son William Deane (or Dean or Dene) was born in the same town in 1570. He married three times (one to Mary Margarey Wickham, one to Elizabeth Cogan). He was the father of John, Margery (Stronge), Walter, and Elizabeth (Jaggers). His son, Walter Deane, was born in Chard, Somerset, England around 1612. He came to colonial American aboard the Speedwell in 1637, landing in Plymouth Colony. There he married Eleanor Cogan and had the following issue with her: Mary (Wilbore), Benjamin, James, Ezra Sr., William, and Joseph. 1) Benjamin Deane or Dean who was born in Taunton, Bristol, MA and married Sarah Williams, having the following children with her: Hannah, Elizabeth R., Israel, Sarah, Mary (Edson), Damaris (White), Benjamin Jr., Ebenezer, Mehitable (Richmond), Josiah, and Lydia (Snow). 2) James Dean or Deane was born in Taunton, Plymouth Colony in around 1647. He married Sarah Brown and Sarah Tisdale, and had three issue prior to his death in Plainfield, Connecticut: James, William, and Jonathan. 3) Ezra Deane Sr. was born in Taunton, Massachusetts in 1650 AD. He married Bethia Edson and had three children with her: Ezra, Seth, and Margaret (Shaw). Ezra Sr.’s son, Seth Dean, was born in Taunton, MA in 1683. He married Mary Cobb and had three issue with her: Sarah (Chase), Edward, and Silas. His son Silas Deane was born in Taunton, MA in 1719. He married Joanna Whitcomb and had a son with her named Lot. Lot Dean was born in Hardwick, Massachusetts in 1757. He married Ruth Perrin and had three issue with her: Silas P., Stephen Mynell, and Merrick Perrien Stephen Dean. His son Merrick Perrien Stephen Dean was born in Ware, MA in 1797. He married Mary Stratton Benton and had a son with her named Hiram. Hiram Lucius Dean was born in Rutland, MA in 1844. He married Marion Elizabeth and had the following issue with her: Edward Schuyler, Adelaide Mary, Charles Lucius, Alice Melissa, Carrie Marion (Pruyn), Grace Mildred (Maynard), Elizabeth Miles (Lovejoy), Helen Louise (Vinning), and Hiram Lucius Jr. His three sons were born in Iowa during the 1860s and 1870s, the last of which passed away in 1953. The book Genealogical Guide to the Early Settlers, mentions several American bearers in the 1600s. 2) George Dean of Salem, MA, 1660-1686, was a cordwainer by trade and married Elizabeth, had issuye named Elizabeth, John, Thomas, George, Joseph, Benjamin, Elizabeth, Hannah. 3) James Dean of Stronington, a blacksmith by trade, had children named John (1672), James (1674), Sarah, Mary, Francis, William, and William (1689). Honorable Silas Dean, 1758, the ambassador to France along with Benjamin Franklin, descend from this line. 4) John Dean of Dorcehster, came to colonial America or the New World in 1636 from Chard, Somersetshire, England. He moved to Taunton, MA. He had a wife named Alice, and had issue named John, Thomas, Israel, Isaac, Nathan, and Elizabeth. 7) Jonas Dean of Scituate, 1690, by Deane, presumed to have come from Taunton, England and had children named Thomas and Ephraim. 9) Samuel Dean of Stamford, 1650, had a son named John in 1659, Joseph in 1661, and others. 10) Stephen Dean of Plymouth, MA, who came to New England aboard the Fortune in 1621. He built the first corn mill in New England. He married Elizabeth, widow of Mr. Ring, and had issue named Elizabeth, Miriam, and Susanna. 11) Thomas Dean of Concord, who came aboard the Elizabeth and Anne in 1635 at the age of 32. He was a carpenter by trade. He married a woman named Elizabeth and had Sarah, Mary, Hannah, Elizabeth, Joseph. In some documents, his surname is spelled Dane. 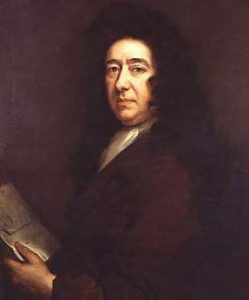 12) Thomas Dean of Boston, a prominent merchant, came from Hampshire, England, and was born around 1640. In 1665, he married Sarah, daughter of William Brown of Salem, MA, and had issue with her named Sarah and Elizabeth. He later married Ann, daughter of William Farr of London, and had issue named Thomas (1673), Rebecca (1677), James, and Samuel. 13) Thomas Dean of Charlestown, a mariner by trade, who, in 1668, married Elizabeth, daughter of John Burrage, and had children with her named John and Catherine. 14) Thomas Dean of Boston, MA who married Jane, daughter of Richard Scammon of Exeter, and had issue named Mary (1692), Thomas, Elizabeth, and Jane. 15) Walter Dean of Taunton, brother of John, came from Chard, Somerset, England. He was a freeman in 1638. He married Eleanor, daughter of Richard Strong of England, and had issue including Ezra, Joseph, and Benjamin. He was a representative in 1640 and was a selectman for years after. 16) William Dean, of Woburn, who in 1670, married Martha, likely daughter of Thomas Bateman of Concord, and had children with her named Martha (1671), William, Samuel (1675), John, and Sarah. 17) William Dean of Boston, MA, 1668, married Mehitable Wood in 1677. He had issue named Hannah, Alice, Judith, Josiah, and Abigail. Other settlers in colonial America bearing this surname who came in the next century include: Elizabeth Dean (Virginia 1703), James Dean (Virginia 1705), Daniel Dean (New England 1725), and Barzillai Dean (New England 1745). In Canada, one of the first settlers bearing this last name was Robert Dean, who came to Nova Scotia in 1774. In 1778, one William Dean came to Halifax, Nova Scotia in 1778. In Australia, one of the first settlers with this last name was Benjamin Dean, a convict from Chester, England, who came aboard the Ann in 1809, landing in New South Wales. In 1820, Samuel Dean, a convict from Middlesex came aboard the Asia in 1820, also settling in New South Wales. In 1824, Isaac Dean, a convict from county Warwick, England, came aboard the Asia and settled in New South Wales. In New Zealand, one of the first settlers with this surname was William Dean, a farmer by trade aged 20 years, came to the city of Wellington aboard the London in 1840. In 1840, Jabez and Ann Dean came to Port Nicholson aboard the Oriental. 1) Argent a lion statant. In chief a crescent between 2 mullets. Bookplate Ruthven Deane, Chicago. 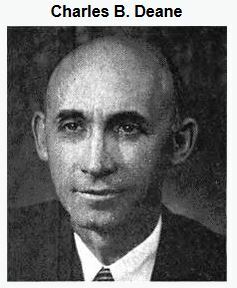 Also George Clement Deane, B. E. S. del. 1901. 2) Vert on a chevron between 3 griffins’ heads erased [or beaked gules] 5 pierced mullets sable a crescent in chief for difference. Crest: a demi-griffin. Bookplate John Deane. 3) Argent a lion statant. In chief a crescent between 2 mullets. Bookplate Ruthven Deane, Chicago. Also George Clement Deane, B. E. S. del. 1901. 4) Vert on a chevron between 3 griffins’ heads erased [or beaked gules] 5 pierced mullets sable a crescent in chief for diff. Crest: a demi-griffin. Crest: a demi-griffin. Bookplate John Deane. 1) John and Walter Deane, of Taunton, Massachusetts in 1637, from Somerset, England. Arms: Gules, a lion couchant, guardant or, on a chief argent three crescents of the field. Crest: A demi-liom rampant or, in the dexter paw a crescent gules. Motto: Forti et fideli nihil difficile. 4) William Deane of Gosfield, county Essex, England, son of William, confirmed 8 May 1577 by Flower. There are hundreds of notable people with the Dean surname. This page will mention a handful. Famous people with this last name include: 1) Paul Dee Dean (1912-1981) who was nicknamed “Daffy”, an professional bitcher in the American Major League, born in Lucas, Arkansas, having played from 1934 to 1943 for three teams (mainly the St. Louis Cardinals), 2) Paul Dean (1789-1860) who was a pastor in Boston, MA, of the First Universalist Church, and the Central Universalist Church, 3) Jimmy Ray Dean (1928-2010) was an American country music artist, TV host, actor, and businessman born in Plainview, Texas, best known for creating the Jimmy Dean sausage brand, 4) James Byron Dean (1931-1955) was an iconic American culture figures and actor, best known for his roles in Rebel Without A Cause, having been born in Marion, Indiana, and died young in a car crash, 5) Howard Brush Dean III (1948) is an American politician who served as the 79th Governor of Vermont from 1991-2003, and was a candidate for the Democratic nomination during the presidential election of 2004, 6) Jay Hanna “Dizzy” Dean (1910=-1974) was the son of Jerome Herman, was a professional pitcher in the MLB who played from 1930-1947 for the St. Louis Cardinals and Chicago Cubs, a 4x All Star, 7) Kevin Charles Dean (1969) who was born in Madison, Wisconsin who played professional hockey in the NHL for four different teams (ex. Atlanta Thrashers and Dallas Stars) from 1991 to 2002, 8) Major General Anthony John Deane-Drummond (1917-2012), son of Colonel J.D. Deane-Drummond, born in Upton-upon-Severn, was an officer in the British Army who spent most of his time with airborne forces and serves in World War II, 9) Charles Bennett Deane (1898-1969) who was a US Representative from North Carolina who served from 1947-1957, 10) Henry Deane (1440-1503) who was the Archbishop of Canterbury from 1501 until 1503, also having held numerous other positions such as Lord Chancellor of Ireland and Bishop of Bangor and Bishop of Salisbury, and 11) Sir John Deane (1583-1626) who was an English politician who served in the House of Commons for Essex from 1621-1622. Three of the main heraldic symbols depicted within the Dean Coat of Arms (incorrectly referred to as the Dean Family Crest or Dean Family Shield) are the crescent, wing, and chevron, each which have their own unique meaning. Wings are frequently observed in coats of arms. Unless otherwise specified they should be shown as eagle’s wings, with a realistic appearance. They can appear singly or in pairs, in which form they are very often found in the crest, which rests above the shield in a full achievement of arms. Wade, quoting Quillim, suggests that the use of the wing on the shield signifies “celerity and protection or covering”. The chevron is one the major shapes used upon a shield, known as ordinaries. The inverted ‘V’ of the chevron is perhaps thought to have originated to represent a military scarf folded on the shield, or additional cross-pieces used to strengthen the shield and painted a different colour. It has also acquired the meaning of “Protection… granted… to one who has achieved some notable enterprise”, possibly because of its resemblance to the roof truss of a house. It may have been a symbol given to people who built fortresses, churches, or castles, or people who accomplished other great works or faithful services. The symbol is born on many police and military uniforms and often indicates length of service. Examples of chevrons are found as early as 1800 BC on pottery in the palace of Knossos on Crete in present day Greece. The Spartans used the capital lambda (shaped like a chevron) on their military shields. The symbol was popular early on in Normandy and Scandinavia.